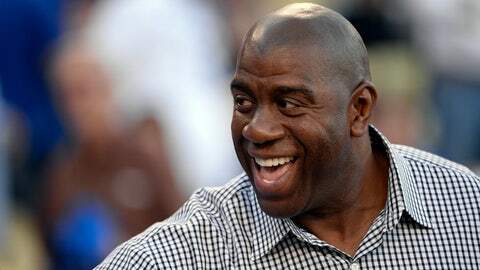 Magic Johnson says Lakers owner Jim Buss needs to take a few pages from the book written by his father, Jerry Buss. Magic Johnson has never been reluctant to give his opinion on how the Lakers are playing, and Wednesday he said the problems on the court can be traced to the owner’s office. Johnson, whose Hall of Fame playing career included five NBA titles in 13 seasons with the Lakers, says owner Jim Buss needs to take a few pages from the book written by his father, Jerry Buss, who made the Lakers one of the most successful and entertaining franchises in professional sports. "This is what happens when you make the wrong decisions, two coaching wrong decisions, giving Steve Nash that deal, it’s backfired," Johnson said during a meeting at The Times between Dodgers officials and Times writers and editors. Johnson is a part owner of the Dodgers. "The biggest problem they’re going to have right now … you’ve got to get a guy like Jerry West to be the face of the team. … You’ve got to have someone helping Jim. He’s got to quit trying to prove a point to everybody that he can do it on his own, get his ego out of it, and just say, ‘Let me get someone beside me to help achieve the goals I want.’ "
Johnson acknowledged that getting West to return would be difficult but added that having an empowered person in the general manager role is crucial. "You need to get someone like Jerry to be the face, so agents are comfortable, players are comfortable, knowing the Lakers are going for a championship. … Look what Pat Riley did in Miami," referring to the former Lakers coach who built the current team featuring LeBron James, Dwyane Wade and Chris Bosh. If Pat Riley’s not there, you don’t get LeBron to buy in." Johnson said that current Lakers General Manager Mitch Kupchak is doing a good job. "Mitch is great," he said, "but he doesn’t have the power." Added Johnson: "Everybody’s telling me free agents don’t want to sign [with the Lakers]. … They’re looking at the Lakers now as a team that’s dysfunctional; who’s their leader, who’s the guy?" The Lakers (14-25) are in one of the worst slumps in franchise history, losing 12 of their last 13 games. They fell to 14th place in the Western Conference with a 121-114 loss at Phoenix on Wednesday. "Dr. Buss was smart," Johnson said. "He said, ‘I’m going to get the best dude, Jerry West, and he helped me achieve my goals. Then I went and got the best coach [Phil Jackson].’ He wanted to work with the best." West, general manager of the Lakers from 1982 to 2000, is a consultant with Golden State. To be sure, injuries have played a significant role in the Lakers’ woes. Kobe Bryant, Nash, Steve Blake, Jordan Farmar and Xavier Henry are all out now. As for Bryant, Johnson said there should be no rush to return to the court even after his broken knee has healed. Should Bryant sit out the remainder of the season? "He’s got to," Johnson said. "What is he coming back to? He’s not going to be able to stop the pick and roll, all the layups the Lakers are giving up. He’s been hurt twice, give him the whole year to get healthy." Johnson added that the Lakers should have taken their time re-signing Bryant. They gave him a two-year, $48.5-million contract extension in November. "You’ve got to wait to see who do I have the opportunity to sign?" he said, referring to the NBA’s free-agency period in six months.